In 2002 the Women’s Health Initiative (WHI) study discovered synthetic progestin and estrogen taken together increased breast cancer risk. Only bio-identical progesterone is identical to the progesterone the body naturally produces. It does not induce breast cell growth and in fact seems to be protective against breast cancer, as several studies listed in an October 2009 Life Extension Magazine article indicate. 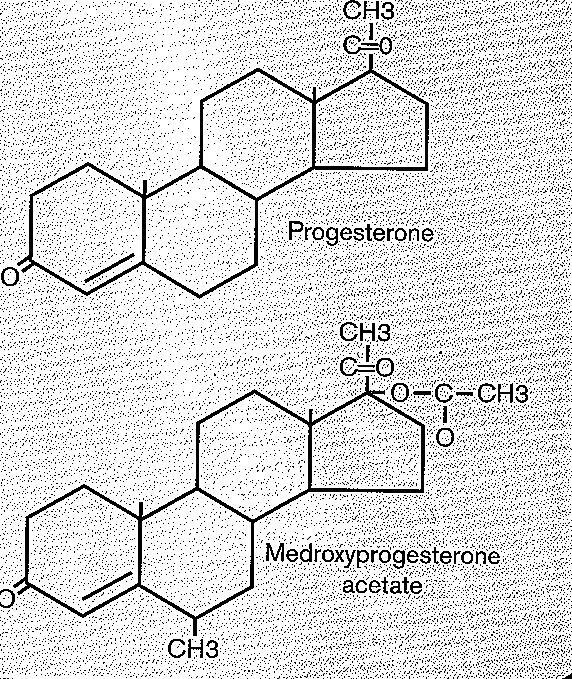 The results of the Fournier study, a 12 year study involving over 80,000 women, also confirm that not all progesterone is created equal. The association of estrogen-progesterone combinations with breast cancer risk varied significantly according to the type of progesterone. Another study showed pre-menopausal women with progesterone deficiency were 5.4 times more likely to get breast cancer. Scientists think this is because progesterone causes cell death (apoptosis) and promotes cell differentiation, when it binds with breast receptor cells. This action is quite different from certain types of estrogen which stimulate breast cell growth. As women approach menopause, progesterone levels often decline more rapidly than estrogen levels. This hormonal imbalance, called estrogen dominance, may be linked to the development of breast cancer. Estrogen and progesterone levels can be determined through saliva or blood tests. An imbalance can be corrected by supplementing with bio-identical progesterone cream and/or oral bio-identical prescription progesterone (Prometrium). A saliva or blood test can be ordered by an integrative health care provider or you can order a test kit yourself here. It is highly recommended that results be reviewed by a doctor knowledgeable about hormones (see Life Extension innovative doctors finder ). Another way to reduce estrogen dominance is by taking DIM or I3C which aid in metabolizing estrogen down non-carcinogenic 2OH metabolite pathways. Estrogen is actually 3 separate hormones: estrone, estradiol, and estriol. All of these are broken down into smaller metabolites. The stronger estrogens, estrone and estradiol, bind to alpha receptors becoming either 16 alpha hydroxylase (16OH) or 4 alpha hydroxylase (4 OH) metabolites, which can become carcinogenic. The weaker estrogen, estriol, binds to beta receptors becoming non-carcinogenic 2 alpha hydroxylase (2OH) metabolites, which actually inhibit cell growth. The estrogen metabolite index (EMI) measures the ratio of non-carcinogenic (2OH) metabolites to potentially carcinogenic (16OH) metabolites. Ideally this ratio, from a blood test or 24 hour urine test, should be >2 for premenopausal and >1.7 for postmenopausal women. Studies have also shown women with breast cancer have lower estriol levels. The estrogen quotient (EQ), (which is estriol/estrone plus estradiol) is a good predictor of breast cancer according to a 1966 JAMA article by Dr. Henry Lemon. However, he cautions that even estriol, the “safe” estrogen should be used in combination with bio-identical progesterone and in the smallest possible dosage, as there are no guarantees.